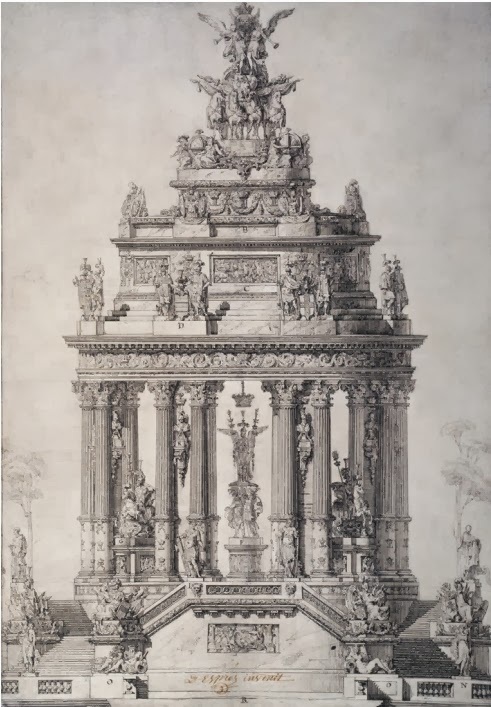 "This highly complex drawing was produced by Desprez for the 1772 Grand Prix of the French Academy of Architecture. Here, he has designed a monument based on a circular temple or tholos. The architecture is richly adorned with symbols and allegorical statues evocative of the Bourbon dynasty, including ﬂeur-de lis, suns, Gallicroosters and the intertwined initials ‘L’ and ‘H’ representing the current Bourbon monarch Louis XVI and the founder of the dynasty Henri IV. The capitals of the temple’s columns are based on those of the ‘French Order’ developed by Jules Hardouin-Mansart and used in the Hall of Mirrors at Versailles. Perhaps because of this overly complex decorative scheme,Desprez failed to win the Grand Prix with this submission. He left France in 1784 to enter the service of the King of Sweden, Gustave III." 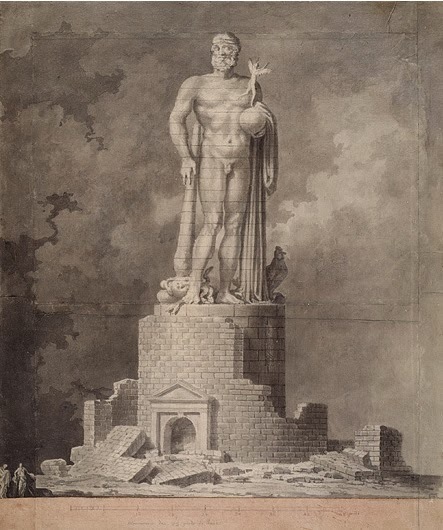 The second offering is a Hercules by Ennemond Alexandre Petitot (1727-1801) intended to adorn the Napoleonic Cisalpine Republic. It is probably as well that this neo-classical delight never made it past the drawingboard - it would have been 83 feet tall! Image courtesy of Sir John Soane Museum. "Although born and trained as an architect in France, Petitot worked mainly in Italy. Having won the Grand Prix of the Academy of Architecture in 1745, at the age of eighteen, he took up a residency in Rome the following year, where he joined the ranks of French ‘Piranesians’, such as Clérisseau, Vien, Challe and Le Lorrain. In 1753 he entered the service of the Duke of Parma and founded the Academy of Fine Arts there. This drawing probably relates to a plan for a new district of Milan, which between 1797 and 1802 was the capital of the Cisalpine Republic – a short-lived French client state founded byNapoleon. Hercules of Gaul was a particularly popular subject during the French Revolution. Petitot based his ﬁgure on a well-known antique statue but with the addition of the French cockerel."